After rock climbing at Cat Ba Island (Halong Bay) Vietnam, I have to say I was impressed. Cat Ba Island is a little slice of Island Paradise, complete with beaches, great weather, and excellent climbing. Before going there I really didn’t know what I would encounter, but after arriving I quickly discovered that I wished I would’ve planned to stay longer. Cat Ba Island has great climbing, although, it in no way can compete with the quantity or diversity found at some of the other SE Asia climbing spots like Thakhek or Tonsai. Cat Ba has a good diversity of climbing with a range of styles on good quality limestone, which hasn’t become polished yet. And I can’t forget to mention, with Tonsai’s recent closures, it has now become the spot in SE Asia for DWS. The island itself has a relaxed vibe, a great change of pace compared to your average city. There are also some other fun things to do on your rests days such as visit the national park, visit the islands beautiful beaches or go kayaking. If you’re looking for partners, the Cat Ba Climbers page makes it easy to find one. Also, Cat Ba is probably the most convinient place in SE Asia to stay and work in the climbing shops (for all those digital nomads such as myself). They’re usually looking for a minimum one month commitment, but you’ll have all expenses paid and plenty of time to climb. There is a range of climbing on Cat Ba, but it can be generally divided into two types, sport climbing at various crags around the island, and DWS in Ha Long Bay. So we’ll start with the sport climbing. There are a few things you should know. For one, you’re going to need a scooter (or taxi) to get to the crags. Lucky, they can be rented nearly everywhere around the island, and for really cheap. A full day rental is around 80,000 VND (3.50$). No paperwork or license required, gotta love Vietnam! Another thing to know is that you need to get ‘safety checked’ before you can go to most of the crags around the island. The safety checks can be completed at Cat Ba Climbing or Asia Outdoors. Depending on what crag you choose to go to determines which place you need to get safety checkeda. For instance, if you want to go to Butterfly Valley, you will need to get safety checked at Asia Outdoors, on the other hand, if you want to go to Hidden Valley, you need to go to Cat Ba Climbing. To my surprise they actually checked when I arrived at the crag. The “rules” get changed pretty frequently, so I would make sure to ask when you arrive. The biggest crag on the island is Butterfly Valley. Its exact location can be found here. It takes about 35min from Cat Ba Town to arrive on scooter. The roads are all well maintained, and once you get close there are signs to direct you towards the correct parking lot. The climbing here is featured limestone, with a lot of pockets and cracks to use for holds. There is a mix of vertical to very overhung routes. The rock is superb quality, though at times the less popular routes are a little dirty. A helmet is essential. Holds break frequently here (same as everywhere else in the island). The setting itself is extremely pretty, surrounded by local farms and green mountains. Once you’ve arrived you feel like you have truly escaped the chaos which normally dominates SE Asian towns. Arguably, this is the best crag on the island. A must visit! Mother Butterfly (6a+) – A great warmup. Elephant Man (6b+) – The best 6b+ you’ll ever climb. A pocketed crack that gives you lots of hands, but your feet are a different story. Super. Buffalo Love (7a+) – A Dihedral crack leads to a slabby face up top. Excellent. Prayer of the Mantis (7b) – Arete climbing at its finest. Thin and technical. The second biggest crag on Cat Ba. This has a nice range of climbing suitable for everyone. Make sure to get your pass from Mr Zoom at Cat Ba Climbing! The climbing here is characteristic of the rest of Cat Ba, featuring vertical faces and powerful overhangs. Bring your bug repellent because the mosquitos can be oppressive, especially after a rainstorm. Monocle Man (7a+) – Starts vertical with the technical crux down low, finishes with a steep pumpfest! Green Lungs (5c+) – Probably the best warm up around. Very fun. The Shampoo Effect (7b+) – Nails. Slabby start leads to a merciless pumpfest. Is it just me or are these routes all sandbagged? I’m sure it’s not last night’s beer talking. Great climbs on surprising polish rock. Expect to have a few locals stop to watch you throw yourselves at the wall. This place has its own charm because it is overlooking the Ben Beo Harbour, so you get some cool views for pictures. Not a bad day out, especially if you’re looking to get your confidence crushed. Animal (7b) – Thin climbing to start leads to a nice rest, then punch out of the cave. The Cave is a small crag, great for a rainy day as the routes are mostly protected. And only about a 5 min drive from Asia Outdoors. 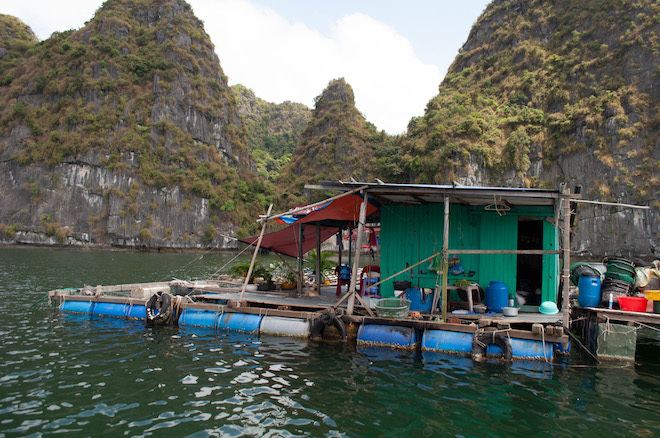 The cave is on private property, so you’ll have to pay the landowner around 10,000 VND. He’ll point you in the direction of the path. There are a nice mix of climbs here, a few fun warm ups and a couple hard roof routes if you’re keen. It’s a relatively small crag so you could probably try most of the routes in a day. The routes are very fun so I would highly suggest trying it out. Love Handles (6a+) – A great warmup. Don’t Bite the Hand That Feeds (6c+) – Vertical climbing leads to a steep finish on good holds. Very fun. 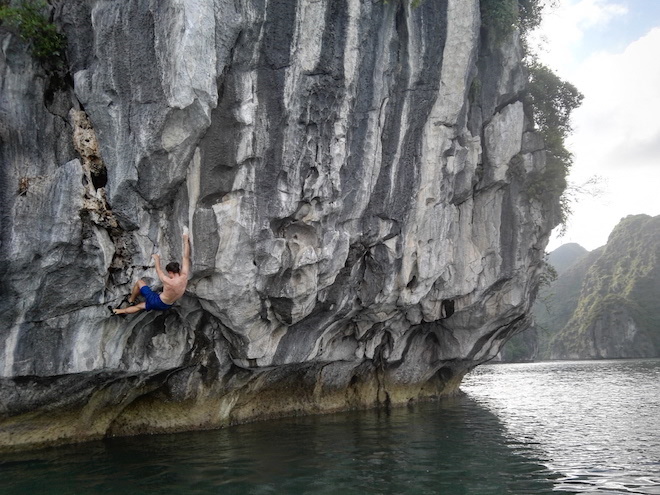 Cat Ba has quickly become the best place in Southeast Asia for deep water soloing, and for a good reason, hundreds of established routes, thousands of possibilities and one of the most beautiful settings you’ll ever see, what’s not to like? To go, book a tour through either Asia Outdoors or Cat Ba Climbing. Tours run every day the tide is over 2m, and cost around 830,000 VND (36$). Tide information can be found here. I would highly advise against any attempts to go on your own. The DWS here is a unique experience you are unlikely to experience anywhere else in the world. I highly suggest it. The crag you go to will vary depending on tides, weather, and experience level of the climbers in your boat. The closest major city is Hanoi and from there it takes about 4 hours to arrive. There are many bus companies to choose from. I used Good Morning CatBa and found that they were very professional. They picked me up on time from my hostel, and dropped me off in front of my accommodation at Cat Ba. I paid 250,000VND for the way there, and 180,000VND for the way back. Your best strategy is to ask around and haggle because there is a lot of competition. Usually the cost is more if you book from your hotel/hostel vs visiting the office themselves (about 100,000VND more). When Is the Best Time To Go To Cat Ba? Most people don’t know this, but it actually gets quite cold in North Vietnam in the winter. For that reason it has some of the best climbing temperatures in SE Asia. The highs in the winter range between 18-20 degrees, and in the summer they go up to 30-35. The summers are not only hot, but wet. Expect rain most days, however it dries very fast. The winters on the other hand, see little rain. This lack of rain coupled with low temperatures make it prime climbing season Dec-Feb. Compared to other places nearby, such as Thakhek and Tonsai, the season is actually quite long. You can climb here year round if you want, which certainly isn’t the same case for most other SE Asia climbing destinations. One very nice thing about Cat Ba, is that it just doesn’t see the crowds at the crags like the other locations do. It is unlikely that you’ll have the crags to yourself, however, I wouldn’t expect to queue up much. 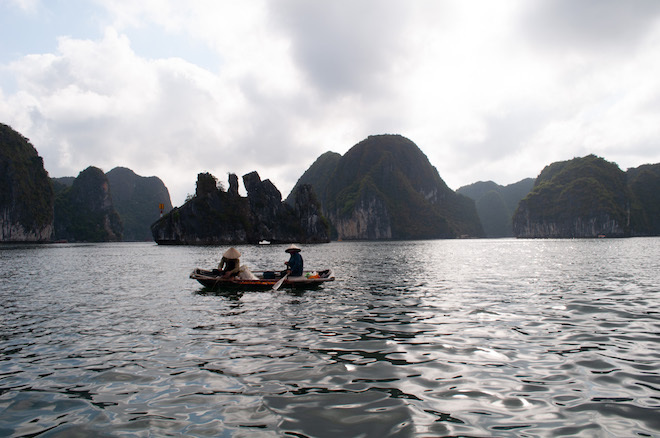 Prices go up in the summer months as this is when the island sees more Vietnamese travelers. The ‘high season’ generally starts somewhere in late May or early June. Even more reason to go in the winter. Cat Ba is a popular spot for non-climber backpackers and Vietnamese tourists. For that reason there is an abundance of cheap accommodation available. Hostels range anywhere from 3-7 USD per night. 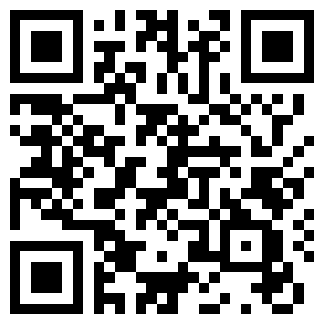 Hotels can be found starting at 6 USD a night. Keep in mind that usually the very cheap hostels/ hotels charge extra for AC, which is absolutely essential in the summer months. Don’t book online if you don’t have to, the prices are always cheaper if you show up in person. Also, try to haggle if you plan on staying for an extended period of time. Prices go up on the weekends as the town gets flooded with Vietnam tourists from nearby Hanoi. Tip: Cat Ba Climbing has a dorm room with 8 beds they rent out. I was paying 50,000 VND a night. It is a great place to go meet climbers if you’re traveling solo. 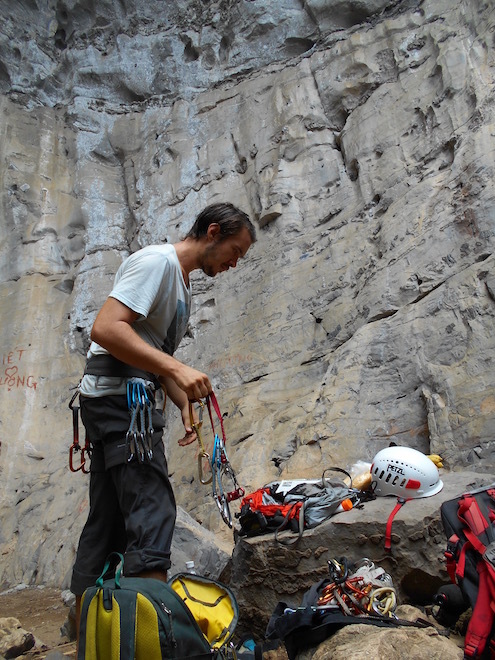 First, if you don’t have your own gear, it can all be rented at Cat Ba Climbing or Asia Outdoors no problem. They have plenty of high quality gear, but it gets expensive if you’re climbing more than a few days. The guide book can be found at both shops. If you ask, they let you take pictures of the topos, so there is no need to buy one yourself. Food at the restaurants is very cheap. For a more basic meal, ie fried rice or noodle, expect to pay 25,000 – 30,000 VND. More ‘expensive’ food such as the fish costs closer to 80,000 VND. The seafood at Cat Ba is amazing. All of it is fresh caught, cheap and tasty. There are a few markets in town, but they raise their prices so dramatically for tourist, you almost end up paying the same as you would at a restaurant. The way they intended it, to be sure. The biggest one near the town can be found here. Go and test your negotiating skills. The beer in Vietnam is in general laughably cheap. Expect to pay 10,000 – 20,000 VND per bottle. But what’s even cheaper is the local brew called ‘Bai Hoi’ (fresh beer), which can be found for around 5,000 VND. For that reason, Vietnam is generally referred to as having the cheapest beer on the planet. Bai Hoi can be found in a few spots on the island. The best place I found was located only a few minutes from Like Cafe. Look for the yellow chairs!! Buddha Belly – Delicious vegetarian and vegan food. The hot pot is the way forward. Like Cafe – Some of the best coffee and fastest internet in town. A perfect place for the digital nomads to get some work done. Yummy – The are two ‘Yummy’ cafes in town, aptly named Yummy 1 and Yummy 2. Good cheap and fast food. Cat Ba is a must visit. It has one of the best mixes of any climbing destination I’ve gone to. Not to mention, it is the spot to go for a budget traveler. You can live here for 10$ a day without breaking a sweat. It is a place that a lot of people show up expecting to stay a few days, but instead stay much longer. You’ll actually find a pretty large group of expats at the climbing shops who have lived here for years. And really, I don’t blame them. Life is good on Cat Ba. Cheap living, beautiful scenery, and enough climbing to keep you busy for years. Vietnamese paradise.